I had looked at getImageData and putImageData methods earlier, but this combination had not worked for me. getImageData returns ImageData object that contains pixel information (RGB and other pixel display properties) of the Canvas. putImageData can be used to draw ImageData back to the Canvas. I thought writing pixel information directly to the Canvas should be faster than copying data from backup Canvas to the main Canvas. But putImageData was not displaying anything on the Canvas in my testing. It turned out that I was calling this function with incorrect arguments. Arguments dirtyX,dirtyY,dirtyWidth,dirtyHeight defines rectangle from the image data to be put on the Canvas. Arguments x and y refer to co-ordinates where you want to put the image data on the Canvas. I was setting value of x an y to the top-left of dirty rectangle on the main Canvas e.g. 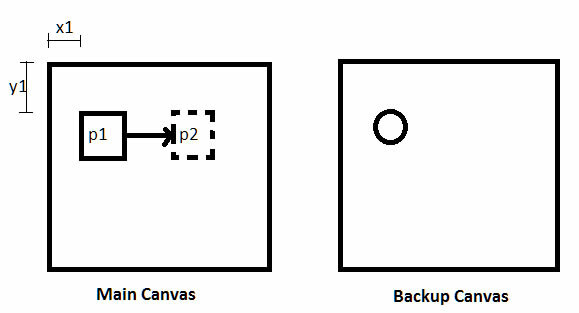 Consider two objects on the main Canvas. One is a rectangle and another one is a circle. The rectangle is overlapping circle, so the circle is not visible. If we move the rectangle from position p1 to p2, the circle should become visible. So just before the rectangle is moved, I paint everything else (in this case it is the circle) on the backup Canvas and get image data of the entire backup Canvas, by calling getImageData(0,0,canvasWidth,canvasHeight). When the rectangle moves to position p2, its earlier position, p1 becomes dirty. So I need to copy content of dirty rectangle from the backup Canvas and paint on the main Canvas. With above changes the animation worked much smoother in my application. Very good information! I have been previously hunting for something like this for a while now. Appreciate it! in the step2,”draw everything from the main canvas to the backup canvas, “,I am not very clear about that.What is the difference between “draw everything on the main canvas” and that? If you draw directly on the main Canvas then you will see images being drawn on that canvas during animation and animation would not look smooth. Instead, you first draw to the backup canvas. When that is happening, nothing is being changed on the main canvas. When all images are drawn on the backup canvas (except moving image), then you draw the entire image from backup canvas to the main canvas in one step. So image transition would be smoother. I believe this is also called double buffering. while using putimagedata, can I use this.